The last two months have been very busy with visitors at the Internado. On June 14, Rachelâ€™s parents, Marcia and David Parsons, along with interns Olivia Singleton and Troy Wetherholt arrived in Ixiamas. Each of them worked on many projects around the internado. Troy was here to assist Bolivar Sanga with the water projects in many of the surrounding communities. Bolivar has trained with Water for All, International (WFA) to learn this appropriate technology that uses manual power instead of machinery to dig wells. The first water project was in Puerto Ruso, where with the help of the Tshimane Indians that live there, two clean water wells were drilled with man power and no mechanical systems. You may read more of the water projects in Troyâ€™s previous blog posts (click here and here). On June 26, Olivia and I joined Rachelâ€™s parents and Mateoâ€™s family with a celebration of their wedding Bolivian style near his home in El Alto. (Left, The new family: Rachel’s dad, Mateo’s dad, Mateo, Rachel, Rachel’s mom and Mateo’s mom.) It was fun to see how different cultures celebrate this happy occasion. All guests bring their gifts to the party, and the following day the families along with the patrinos get together to open gifts. Rachel was dressed in the traditional Bolivian style with the bowler hat and pollera (big ruffled skirt). Mateoâ€™s sister and aunt thought Olivia, Marcia and I needed to experience this style also, so we played dress up. 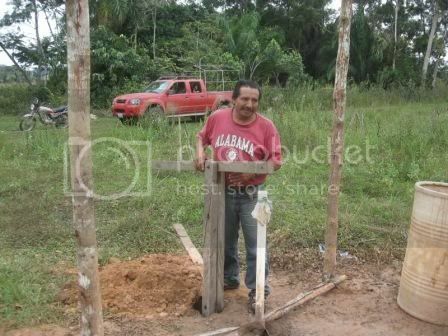 On July 11, a team from Trinity UMC in Birmingham arrived to work with Bolivar to drill a well here to help us with water near the chicken house and gardens. Unfortunately for the team, a weather system from the south followed them with much wind, rain and cold temperatures. We had lows around 50 degrees. You need to remember there are only screen windows here at the internado and Hotel Ixiamas, where the team was staying. We built a fire at the worksite for them to have some warmth and served lots of hot coffee. Fortunately, the team brought some warm clothing for La Paz, not realizing that they would need it in the jungle. The group had Bible school with the kids from town and a night with the internado students inviting their friends. The team learned a lot about travel problems here when we have lots of rain. They left Ixiamas on Friday, July 16, around 2:30 p.m. in two mini buses with Rachel and Mateo headed for Rurre and a jungle tour on Saturday. The first bus arrived around 11 p.m., while the other group slept in their van about 30 minutes from Rurre with a bad tire. This trip normally takes about 4 to 5 hours. I have to commend these folks for enduring the trip with no complaints. Yet, I am sure they were relieved to arrive at the hotel in La Paz. The day before Troy left, we visited two communities a couple of hours away to talk about the water projects with Bolivar. 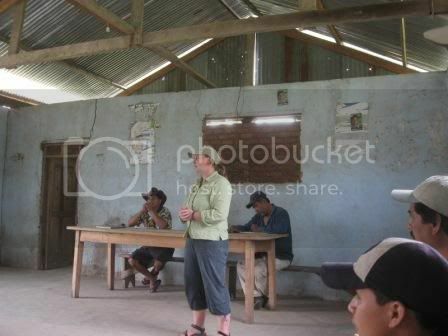 The largest community, Tahua, actually had a town meeting to discuss the project. (Left, Rachel speaks to the group.) It was interesting to see the local government at work in this beautiful community. They had several wells that the government put in, but they no longer worked. The nice thing about our project is that the people do the work, and if problems arise with the pumps, someone there will be able to repair it. Please continue to pray for Bolivar and his projects of bringing clean water to communities that need it.